The German stereotype (which is totally unfair) of being humourless obviously does not apply to the ironic remarks of Mr Neibel. His comment is a joke worthy of the best stand-up. It comes from a representative of a German government who ,along with France, have demanded that countries in the EuroZone – Portugal, Spain, Italy, and particularly Greece – all ignore the wishes of their electorates, and savagely cut public spending. Why? Because German and French banks made reckless loans to these countries, and they must be protected at all costs. Germany’s commitment to democratic government was further demonstrated this weekend, with their proposal that a European Commissioner should be able to veto any budget proposed by the Greek administration (see here). According to NicaNet Heinaluoma added that while he hoped that Nicaragua would take to heart any recommendations from the EU concerning the electoral system, it seemed to him that the majority of the people of Nicaragua accepted the results of the elections and supported the government. Heinaluoma’s comments echo a thoughtful piece by Dionisio Marenco, former FSLN mayor of Managua, and close confidante of Daniel Ortega before a serious falling out (see here). He details some of the failings of the electoral system and the CES (Supreme Electoral Council), many of which have been apparent for at least four elections going back to the mid 90s. 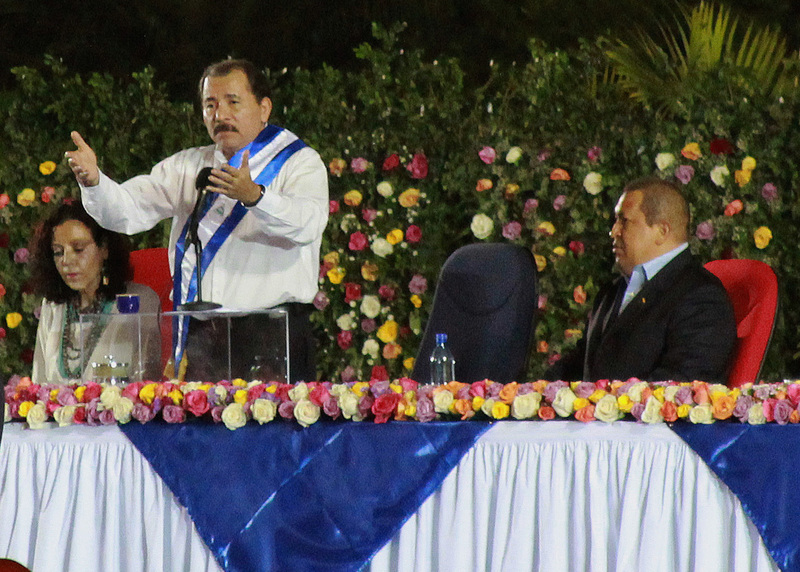 But he also criticises the strategy of the opposition in the run up to the elections, and highlights the achievements of the Sandinista government for the poorest Nicaraguans. And what of the United States, increasingly irrelevant but always dangerous? Hillary Clinton made various threatening noises about cutting back aid last week, as much a response to the Republican candidate race as events in the Nicaraguan elections. Nicaragua’s Foreign Minister, Samuel Santos, delivered a robust reply(see Nicaragua Dispatch’s report here on his remarks). There was also a contribution from “Freedom” House, a US think tank front for hawkish foreign policy (see here for a report, also in the Dispatch, and lively debate in the comments section). Nicaragua has apparently been kicked off Freedom House’s list of democracies, and is now ‘partly free’, sharing the classification with countries like Ecuador, Bolivia and Venezuela (is there some connection there?). What of Honduras, with it’s 2009 coup, siege election and weekly killings of dissidents? According to Freedom House all is well, a solid democracy and definitely ‘free’. Perhaps the jokers at FH should join Mr Neibel for a comedy double act. Wales NSC’s David McKnight visited the Los Quinchos project on La Chureca (Managua’s colossal municipal rubbish dump) last week. You can see David’s photographs of the children from the project in the slideshow above. David visited the project with Cardiff sisters, Kate Saunders and Maggie Barclay (and Maggie’s son Rob Thorburn of ‘Performers without Borders’). As many readers will be aware, we have been supporting the project for the past 4 years, raising over £25,000 to pay the salaries of the support staff who work with the children who live and work on the dump. Maggie and Kate have fundraised a large chunk of this, inlcuding monies from the royalties of Maggie’s books, two of which are about La Chureca. See our post from last year. Thanks again for all your support over the past four years. Quietly, and without a lot of fuss and fanfare, Nicaragua is on the verge of a remarkable energy turnaround. This blog has detailed in the past one of the major achievements of the last Sandinista administration, the solving of the energy crisis within 12 months of taking power in 2007. Before this, powercuts had become a part of daily life. If it created uncertainty for big business, it almost wiped out small businesses, many of whom provided food and drink for Nicaragua’s population. Many saw their livelihoods literally melt away, as the cuts made what meagre refrigeration systems they had worse than useless. Now Nicaragua is poised on the edge of another energy revolution. 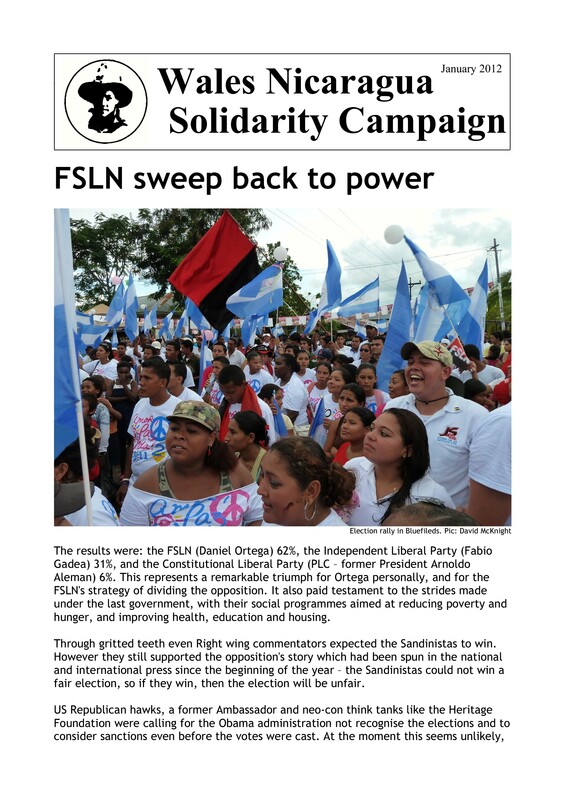 In a recent interview with Tim Rogers in the Nicaragua Dispatch (no cheerleader for the FSLN administration) Paul Oquist outlined Nicaragua’s plans to break the link with oil for electricity production ( see here). Nicaragua currently relies on oil for 70% of its electricity production. This will shrink to just 6% in five years time, with the renovating of its geothermal plants, the continued installation of wind generation, and the building of several large hydro-electric projects. Last year several large windfarms went on-line. Nicaragua also connected it’s first existing geo-thermal plant to the grid (35MW), and is threatening to nationalise the second Nicaraguan geo-thermal plant, which can produce another 35MW, but is only producing 5MW, the result of mis-management and under-investment by a private company. A whole series of hydro projects have been anounced with international backing, including the Tumarin scheme (250MW, half the country’s electicity requirements), supported by Brazil and due to come on line in 2016. Most of the hydro projects will need to be scrutinised carefully. Environmentalists have already lodged objections to some of the schemes, citing their impact on the water courses and the nature reserves which fall within the areas due to be flooded when the dams are built. Nonetheless, taken with the Sandinistas progress on bringing electricity to some of the remotest rural communuities over the past five years, it represents a remarkable turnaround for Nicaragua. Next month the Campaign hopes to interview Paul Oquist, special advisor to the President and leader of the Nicaraguan delegation in the climate change talks in Durban in December. Heddiw gwnaeth aelod yr Ymgyrch, Ben Gregory, cyfweliad ar raglen Nia Roberts ar Radio Cymru. 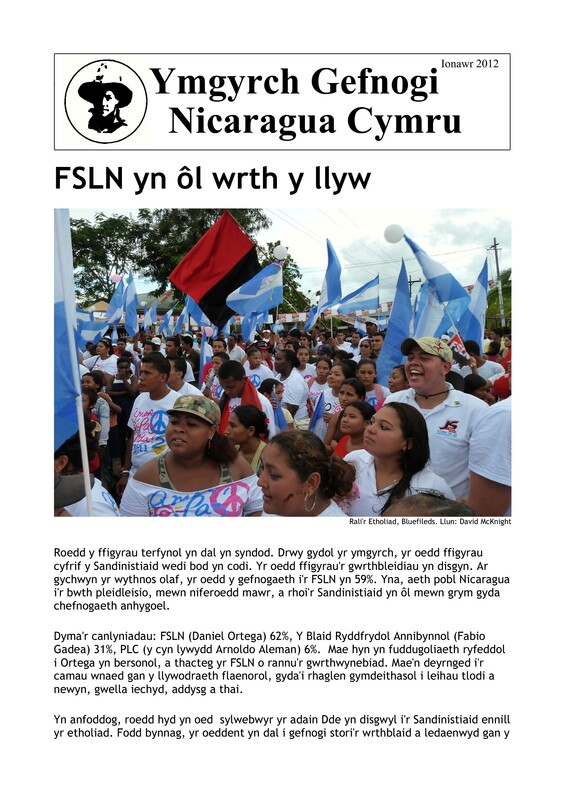 Siaradodd am gefnogaeth pobl Cymru i Nicaragua, yn arbennig i Ganolfan Los Quinchos yn La Chureca, yn ogystal a hanes ei deithiau i Nicaragua dros 20 mlynedd. Two articles on recent regional developments in Latin America give a good summary of the quest for integration, and the politics behind it. The article also include’s one of David’s films on the ALBA, previously posted on the blog. The second article is by Alex Sanchez, one of COHA’s most respected commentators. In “Placing CELAC in the proper Latin American context“, he gives an excellent, if sometimes sceptical summary of the development of CELAC – the Community of Latin American and Caribbean States. It includes a good description of the differences between CELAC and the Organisation of American States, as well as how it fits in with the alpabetti-spaghetti that is Latin American integration.